Description of "Date Your Goals (eBook)"
Are you're a Manager, Executive, businessman or someone who wants to know how to Set, Realize , Plan, Visualize and Achieving Goals, then you're about to discover the answers to your “how to get” right now! - Do Law Of Attraction helps in Goal Achievement. If yes, how? 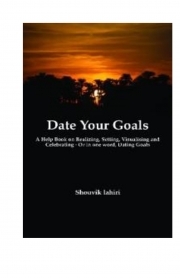 So, if you want to Realize, Set, Plan, Visualize and Achieve your Goals and you want to know How to Achieve your Goals, then "Date Your Goals" is the right choice for you, because Date Your Goals Expert, Shouvik Lahiri, will reveal to you how every Manager, Executive, businessman, regardless of experience level, can succeed - Today! The planet earth pulls every object towards itself by means of the gravitational force that is invisible. Likewise we need a force – the force of confidence, positivity and dedication to achieve our goals – professional or personal, spiritual or earthly. A coach is the best guide who instills this force in us. Shouvik is the coach who’s academic and professional career profiles stand unique with a treasure of expertise and experience. As a trainer, he has trained over hundreds of people in overcoming the stumbling blocks which comes on their way to success in achieving their goals. As a coach he has done personalized one to one coaching to over 80 people including Top Executives, Celebrities and Sportsperson. Reviews of "Date Your Goals (eBook)"